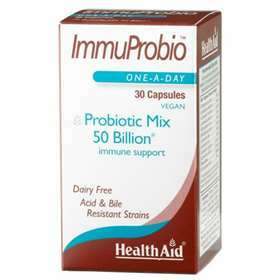 Health Aid ImmuProbio are a vegan friendly probiotic capsule which contains a blend of 50 billion viable bacteria strains and a probiotic Fructo-oligosaccharides (FOS) to maintain and replenish the bodies good bacteria and immune system. Health Aid ImmuProbio also contains an acid and bile resistant strain that helps the good bacteria reach the intestines ensuring their purity and potency. Supports normal bowel function, normal absorption and assimilation of nutrients in the gut. Inhibits the growth of harmful bacteria that may cause digestive stress. Useful in preventing and treating diarrhoea and constipation. Once bottle is open store in a refrigerator. B. bifidum, L. acidophilus, L. rhamnosus, L. plantarum, B. breve and B. longum, L. casei, L. lactis, L. bulgaricus, L. salivarius, bulking agent (rice maltodextrin), fructooligosaccharides (FOS), anti-caking agent (veg. magnesium stearate, capsule shell (veg. cellulose).